This was one of the most curious things that I have seen in a while! 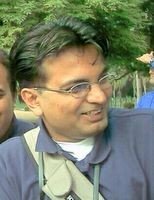 On the 30th of November 2008, M. B. Krishna and me decided to take an early morning walk through Lalbagh. What we had not expected to see were a pair of Spot-billed Pelicans (Pelecanus philippensis) fishing in the most ingenious ways possible. They were waiting near the bridge with other domestic ducks waiting for people above to throw bread-crumbs and other feeds for the fish. The ducks, I guess were feeding on what was thrown for the fish. The fish (cat fish?) would surface to eat the food and become a meal for the waiting Pelicans! 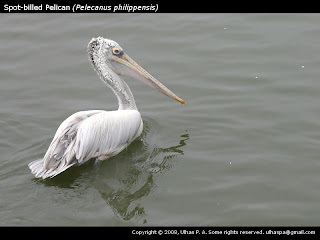 Once they'd gulped down a fish, the Pelicans would go for a short swim of about 10-20 meters and wait. 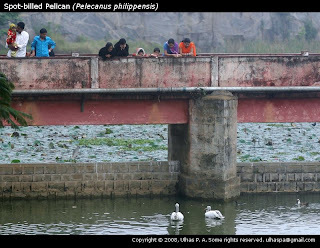 As soon as they'd see some food being thrown, they'd swim back to below the bridge and again feast. They were almost like pet dogs waiting for someone to feed them! Here's an article about this the next day in The Hindu.